Acme Markets, Inc., having their corporate office at Kings Of Prussia, PA, is a pharmacy. They are responsible to ensure effective and safe usage of pharmaceutical drugs. They also undertake surveillance of proper distribution of drugs in the pharmacies of the region. They are also responsible to offer effective service relating to any kind of physician's prescription and even medication. Acme Markets, Inc. is basically a fruit and vegetable dealing supermarket chain, established in 1891 at Pennsylvania. They have their branches and operational outlets over a number of places including New Jersey, Maryland and several other regions of Greater Philadelphia as well. 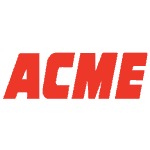 There are currently 1 consumer reviews about Acme Markets Inc available. Share your review.